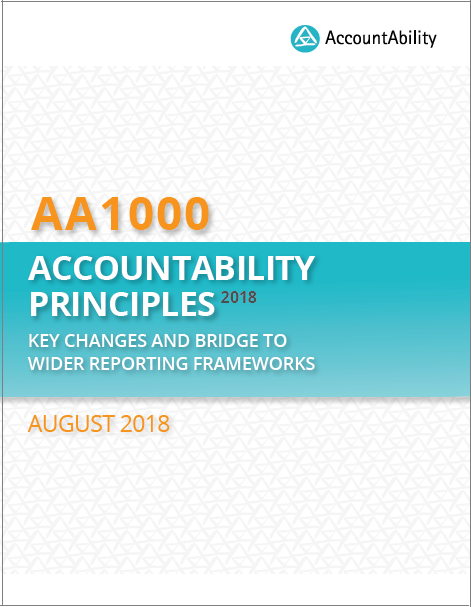 LONDON and NEW YORK, August 21, 2018 /3BL Media/ - AccountAbility is pleased to release a practical guidance document highlighting the key changes made to the AA1000 AccountAbility Principles (AA1000AP, 2018), as well as an overview of alignment with commonly used sustainability-related reporting standards and frameworks. The document serves to support both organisational users and assurance providers in effectively working with the AA1000AP (2018). Improvements to the definitions and adherence criteria related to the Principles are detailed clearly, alongside an overview of all structural and visual enhancements. With these revisions, AccountAbility presents a robust set of Principles that we expect to stay relevant for users of all sizes, geographies and sectors, for a large part of the next decade. The purpose of the AA1000 Principles is to set the foundation to support and guide an organisation’s sustainability management, performance and behaviour. The revision process reviewed the coherence of the Principles with a selection of widely used sustainability management and reporting standards and frameworks. The guidance document provides a summary of the positioning, complementarity and uniqueness of the AA1000AP (2018) in relation to the current sustainability framework landscape. The AA1000AP (2018) – Key Changes and Bridge to Wider Reporting Frameworks document is available for download, free of charge here. AccountAbility is a global consulting and sustainability standards firm that works with businesses, governments and multilateral organisations to advance responsible business practices and improve their long-term performance. Since 1995, AccountAbility has been supporting corporations, non-profits and governments in embedding ethical, environmental, social and governance accountability in their organisational DNA. For more information, please visit www.accountability.org.